Laminating is a process of gluing things together. When wood is laminated, the process typically refers to plastics or other materials laminated to plywood, solid wood or composites. Wood-laminate terminology often refers to flooring but the process of laminating also includes veneer laminating and laminating solid wood together to make furniture. Simple laminating is nothing more than glue and clamps. Laminated composites, plywood and veneered wood are all laminated wood products. The difference is how they're made. They all have a core with a coating or layer on both sides. The difference in laminated wood products typically is the core of the material. Plywood is laminated wood. The core is made with multiply layers of real wood glued together to give it strength. Even though not typically referred to as laminate, plywood is nothing but laminated wood. The durability of plywood resides with its overlapping grain patterns. Each consecutive layer is placed perpendicular to the preceding layer. Laminated composite is particleboard. It consists of particles or wood fibers glued together with resins, heat and hydraulic pressure. This type of laminated particleboard, sometimes referred to as MDL, or medium-density-laminate, resembles countertop laminate. Builders and cabinetmakers use it for cabinets and shelving that is easy to clean and maintain because of its slick, plastic surface that resists moisture. Most MDL cabinets are solid color -- typically stark white -- but imitation wood-grain patterns are available. Laminate flooring is a simulated wood product, which is one reason "laminated wood" has become part of builders vocabulary. Laminate flooring consists of a photographic layer, or "picture," of wood similar to countertop laminate bonded onto wood composites, which usually is particleboard. The laminate is topped off with a durable clear layer and a moisture-barrier backing underneath. Laminate flooring is up to 50 percent cheaper than solid wood flooring. The disadvantage of laminate flooring over solid wood flooring is mostly aesthetics. Laminate flooring doesn't have the natural beauty of real wood flooring and may appear artificial. Hardwood flooring is more exclusive, and even though it shows scratches and is less durable, demands higher resale value than laminate flooring. Laminate flooring is difficult if not impossible to repair if you can't locate a pattern that matches. Hardwood flooring can be sanded, patched and repaired at any point. The uniform quality of laminate flooring makes it easier to work with than real hardwood flooring. Veneered wood is a laminate. The veneer is a thin layer of real wood, typically 1/32 to 1/16 inch in thickness, sliced from logs in sheets. When glued to composites, plywood or solid wood, veneer helps produce a product natural in appearance but more affordable than solid wood for tables, chairs and other furniture. Identify laminated furniture by unnatural grain patterns on the sides. Another indicator is gaps, or flaps of veneer that pull loose on corners or edges. Cheaper laminated furniture might show thicker flaps of plastic laminate that pull loose around edges. Laminated wood parts are affordable, structurally strong and rival real wood because at the core, it is real wood. The majority of wood furniture purchased commercially is a mixture of solid wood and veneered wood laminates. Other types of laminated wood includes bent or curved items such as chair legs, backs or other parts for furniture. Thin strips of wood, typically no thicker than 1/16 inch -- are glued together to form circles, waves or just about any shape for specialized designs. Locate individual layers of wood on curves to recognize laminated bent wood. Bent wood is durable and typically regarded as stronger than solid wood, which can crack or split along grain lines. Woodworkers often laminate two or three pieces of lumber together to get thicker pieces. The process involves wood glue and clamps. 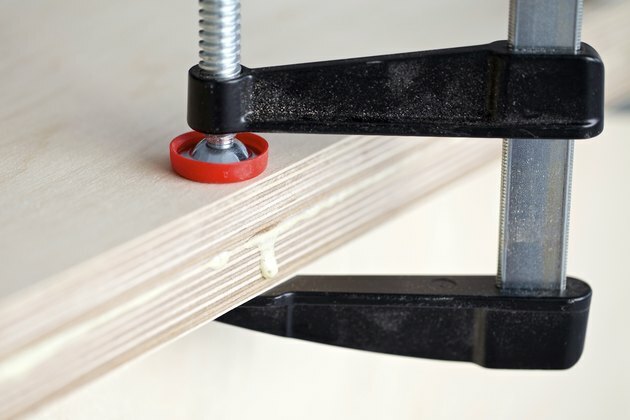 Recognize laminated furniture parts by a thin glue line along legs or when parts are thicker than 3/4 inch. Construction lumber often refers to laminated timber, which is thicker, bigger and strong enough to support the roofs on large buildings. Laminated timber are numerous pieces stacked together or labeled as LVL (laminated veneer lumber) or Glulam (glued laminated beam). Which Type of Wood Is the Strongest?